I have four border collies and we live in an in town neighborhood. We have a large back yard, lots of fun dog things to do, trees, gardens, and room to play and run. This is my laboratory so to speak. Everything new that I am working on starts here, all new sports, games, and/or behaviors. It is a great space and we love it. 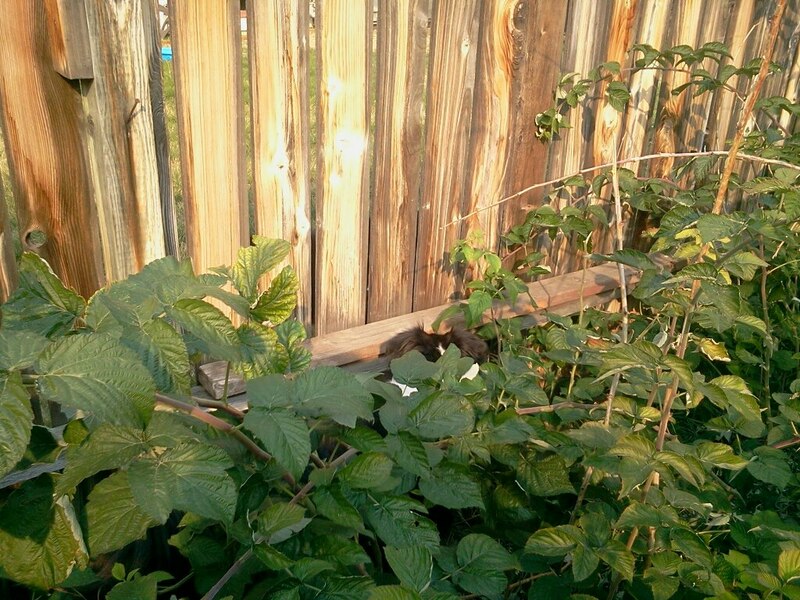 Our wonderful front yard has pocket gardens and fruit trees, and it’s a fun place to work and/or relax with the dogs. That’s my heart space, and my children and dogs enjoy it as much as I do. But with all of this great space we also share fence lines with two other homes, and a busy street with a walking path that is used all of the time. We have gone years without conflict and the peaceful existence is awesome. But we have also experienced years with conflict. This is one of those years. Our dogs have had friends in neighboring yards, but more often, dogs that they would like to see evaporate from planet earth. When we moved here eleven years ago our one neighbor had two older Cocker Spaniels that would run down their kitchen patio stairs, bark and run the fence line, piss off all of the neighbor dogs, and then go back inside. He told me it was their way of saying HELLO! Over course I had another theory, some of which carried four letter words. We have had renters on one side with rotating tenants and rotating dogs. It wasn’t worth the effort so we just put up temporary snow fencing and barriers so there was no rehearsing a behavior we didn’t want. 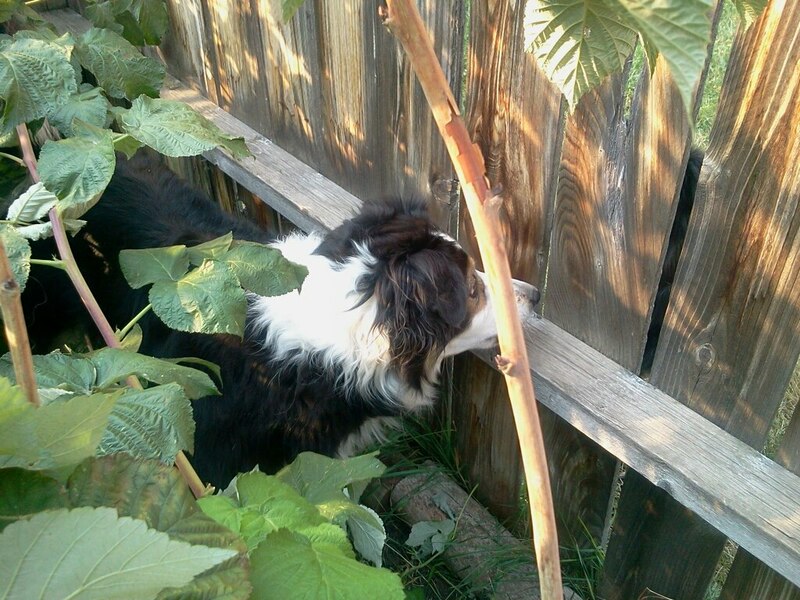 Franny loved to take on the challenge of another dog through a fence when she was younger. I worked on this fiercely for years, it was my mission so to speak. Now that she is older she just lays on her pillow and WOOFS a bit, but rarely goes up to the fence unless she feels there is true danger or malice. Story and Ocean rarely if ever go up to a fence where there is another dog. They don’t want conflict, they would rather play. $eeker, dear sweet compulsive $eeker. We have new neighbors with two border collies. They are in the yard all day unattended. Their owners seem pretty nice, and these are not out of control dogs, but boy oh boy do they have $eekers number. If they want a bit of action they kind of throw out the SIRENS call and $eeker willingly responds. Sometimes they wag tails through the fence and run it, and other times it’s growl and bark fest with ramped up energy. It’s a game, but not one that I like or want to encourage, at all! 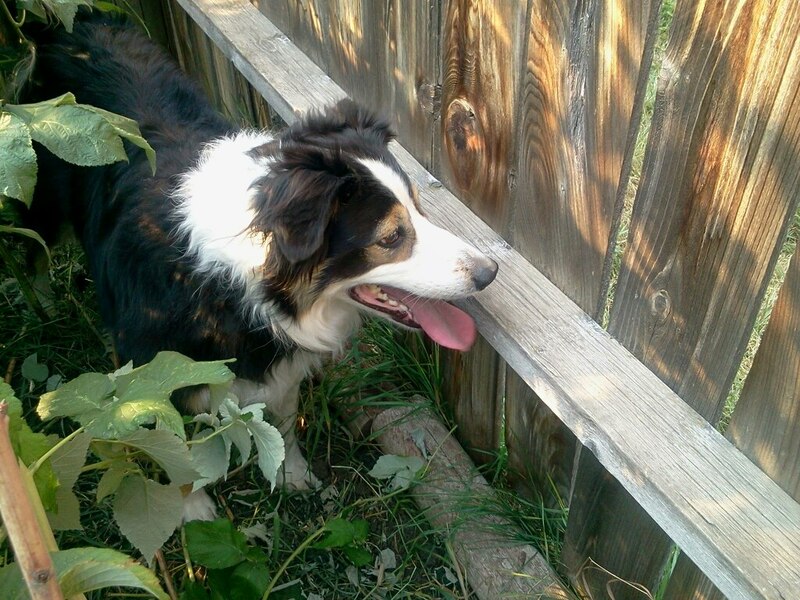 $eeker will not come off the fence line, and what we have found is that if you call his name, it makes it worse. Now if $eeker is working with me, he won’t even give the neighbor dogs an ounce of attention, it’s when work stops or we have down time in the yard while I’m gardening, or watering, or cleaning up. GAME ON! I have to go through the raspberry patch, calmly put his leash on, and he willingly comes with me. If we are walking through the yard together I have to now say, “here to me” which is one of his stronger behaviors, and he does willingly 95% of the time. This morning we worked on treibball and tunnels and he was blasting right past these dogs just on the other side of the fence, not an ounce of attention, even with their devious SIREN call. But when we stopped and everyone was cooling down and getting some water, he took off like a rocket for the fence. Today I followed with a camera. He let me get right next to him and even posed with his friends on the other side. I wanted to see if he could not only hear me, but respond with this incredible distraction.I asked for a kiss and he gave me one, I asked him to sit and he did, I asked for a paw and he lifted his right one. So I said “hear to me” and we walked out together. Bonus that I did not expect. Because he is compulsive and patterns everything he does, I am going to put the snow fencing back up, and again, make this a non issue. He is such a good dog, and so smart, but I also know some of his limitations and this is one of them. We went into the front yard to cool down, closed the gate to the back yard. Peace! Woosh… And then my neighbors who refuse to even carry a leash, and have taught their children that leashes aren’t necessary when they are out on a walk, let there dog come up on our property, to our front gate, and start a barking fest of sorts. I did mention that my front yard and garden space is my heart space and free of conflict right? So we came inside and $eeker went into his crate. When he gets so ratcheted up in arousal he even knows he needs chill time. His crate is his safe place and calm place, and he will voluntarily go in there, which I appreciate and love. As for me, I went right to my favorite real estate sites and started looking at 40 acre parcels far away! Even some shacks in Tahiti were looking kind of inviting! I know it won’t solve anything, I’m painfully aware of that. But it’s cheap therapy on days like today! We live next to two Malamutes that receive no exercise or attention whatsoever. Whenever they hear us playing with our dogs in the backyard – or sense that our dogs are near the fence, they bark, growl and paw the fence. There have been time when I think they’re seconds away from busting through (similar fence as yours). 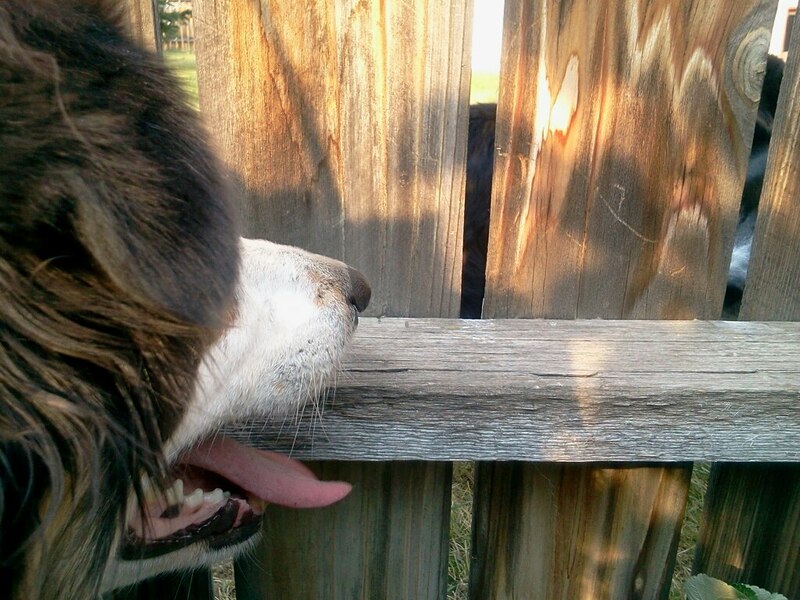 I installed a welded wire fence (with t-posts) 3 feet away from the fence so my dogs don’t go nose-to-nose through the knot-holes. It’s worked for our dogs at least; they ignore them completely. The neighbor’s dogs have ratcheted it down a bit since they don’t get any reaction from our dogs. so we too have fences to guard fences. we’ve done that in years past with success too, it just started to feel too permanent for me and when I planted snow peas to grow on it, I had to face my denial! Man with two malamutes that fence isn’t going to have a very long life! 😉 It’s funny we have never had a neighbor offer to double fence their yard to curb the problem, we have always been the double fencers. Nice to know you are doing it too! If we were neighbors we could simply go fence crazy! WOW! 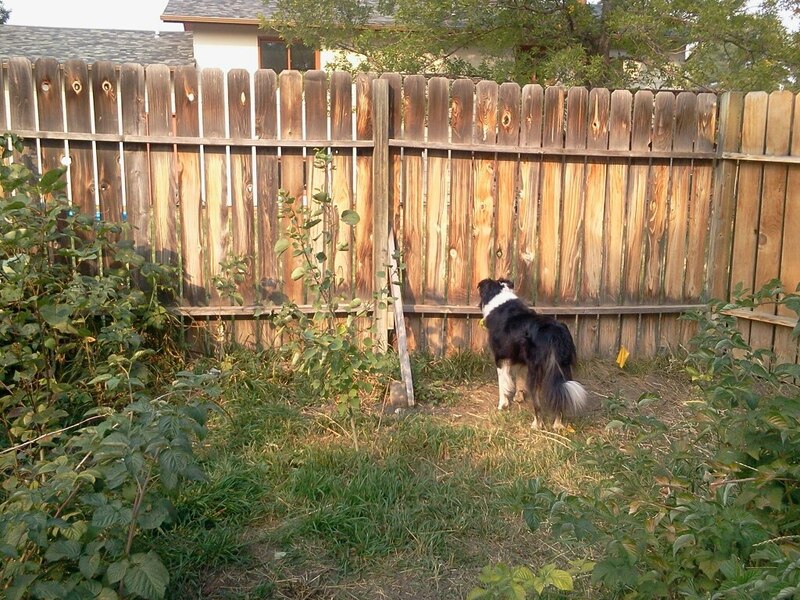 We only live a couple of blocks from you and we have the SAME fence-line issues in our back yard – different neighbors, different dog(s), but similar reaction induced frenzie with Ellie! sane….I just am so disappointed to lose the section of our yard for this reason. I visit the real estate sites myself. I like to look at the wilderness of Tasmania and dream….pristine, peaceful. But I know of someone on a massive sheep property and they have trouble with the neighbours dogs despite the enormous distance between them.There seems to be no ideal place to be. Gotta say that Tahiti sounds nice. Perhaps we could all pool our resources and set up a doggy haven somewhere on a tropical island. Oh to dream. our own island would be nice I think… or perhaps our won little grouping of islands? If we are going to dream, then I am going big! I have an odd shaped back yard, so have 3 neighbors whose fence borders mine. My dogs will generally come when I call them except when they’re barking at the LWD. I manage each situation differently. Situation 3. Benji with a toy. Benji will tease my dogs unmercifully, running up and down the fence with a toy. Seamus in particular makes it his goal in life to GET THAT TOY! I usually put a stop to it, but if I’m in the bathroom or otherwise occupied, he’s been known to drag Benji’s toy through the chain link. Situation 4. Hank is a non-issue. Hank doesn’t bark, I think Seamus in particular scares him. Situation 5. Benji and Hank together. This gets my guys all fired up, but they will come when called. They just have to make noise. Therefore I need to watch who’s outside before I let my guys out, and I do my best to always watch to make sure a toy isn’t involved. Joe, I wished more people would look at their door before letting their dogs into the yard. Just to be considerate to neighbors… Actually our clients that live near Yellowstone Park have to do this because of the potential predator/wildlife risk, and the safety of their dog/s. I try to always watch my guys, I mean, I’m not totally successful, they’ve dug a few holes, but for the most part they are only out when supervised. I’m probably not suppose to be laughing but you should not have made it sound so funny! laughing is healthy… I’m glad my words make you happy! Love you!